The municipality of Ortaköy (35,519 inhabitants in 2012, 18,384 in the town proper; 72,519 ha) is located north-west of Aksaray. 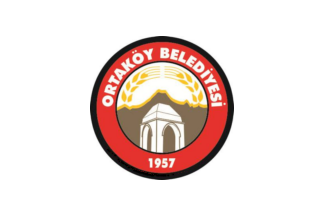 The flag of Ortaköy (photo) is white with the municipality's emblem in the middle. "Belediyesi" means "Municipality". The emblem of the municipality features the claimed tomb of the poet and Sufi mystic Yunus Emre (photo). Hundreds of villages claim to be his birthplace, many more claim to host his tomb, and different sources place him in different centuries, all dying for the honor of association with this great poet. He likely lived from 1240-1241 to 1320-21, when he was 82 years old. He almost certainly lived in the Karaman (Larende) area and belonged to a family who emigrated from Horasan to the village of Seyh Haci Ismail. The village is believed to have been founded by the head of Yunus' family Seyh Haci Ismail when they moved to Anatolia with his followers. The rest of his life - whether he was a wandering dervish or a Seyh of a tekke, his tariqat (or Sufi order), his poetry, and finally his death are all mysteries, with various sources giving various different interpretations. As a popular poet, the most important aspects of Yunus' life are not historical details, but how the common people of Anatolia viewed his life. This is revealed very beautifully in legends and poetry; some people even suggest that "Yunus" is actually a school of thought in 13th century Anatolia, not a single person. Yunus' impact on Turkish culture can be seen in various ways. During the efforts to purify the Turkish language in the 1920s his poetry was a prime example of the dialect of Anatolian peasants. Several authors claim that many idioms in everyday language are actually verses from his poetry. His philosophy, metaphysics and humanism have been examined in various symposiums and conferences on a regular basis both in Turkey and abroad. UNESCO named Yunus Emre one of the main cultural figures of world, and dedicated 1991 as "The International Yunus Emre Year". His work has been translated into several languages, and historians consider his system of thought important for clues about thirteenth-century Anatolia.